This wedding day was perfection starting out with the bridal prep space of my dreams until their super cute and unique exit! Leigh and I were finalizing details for her wedding day and she told me about the perfect spot to hang her wedding dress for my detail shots. She is a woman after my own heart when it comes to details and she couldn’t be more right about this prep space! Her momma’s sunroom was so relaxing and felt like home. I have now added a sunroom just like it to my dream house plans. I did all the details photos in that room and could have done an entire session in that room, the light was THAT good. After hair and makeup with Coiffeur Collective was finished up we left for the ceremony venue. 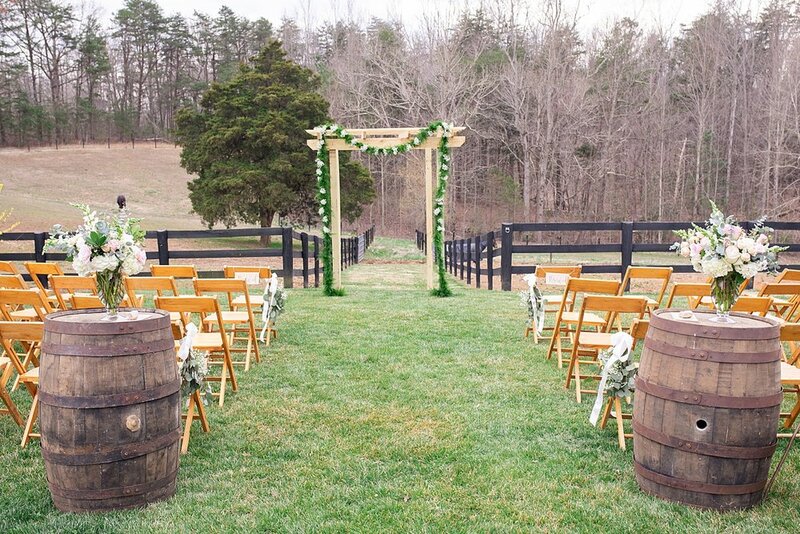 The ceremony was held at Trevor’s family farm. 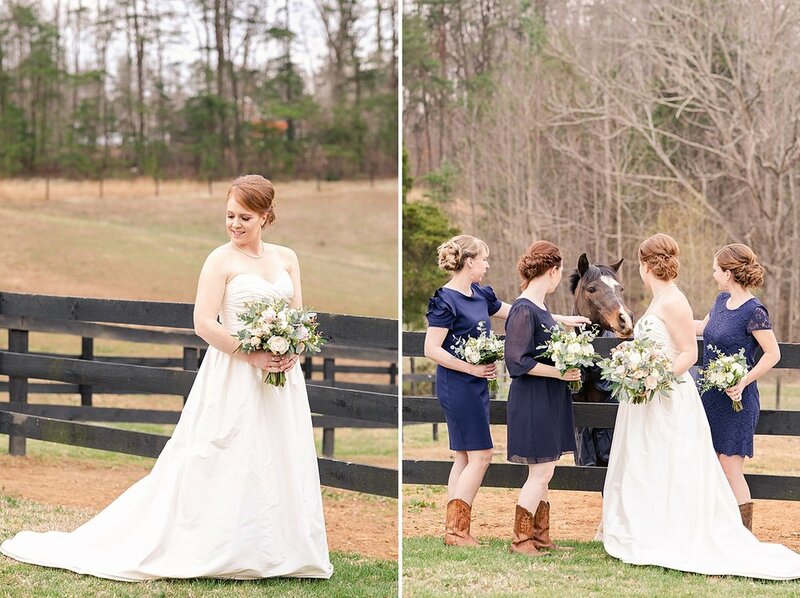 This beautiful property was decorated by the talented Foxtail Cottage Florals and Festive Fare Rentals. 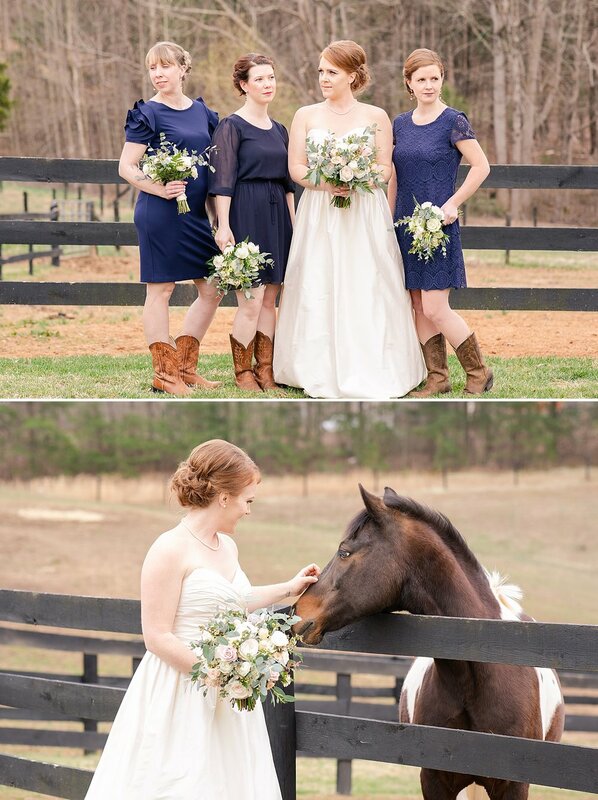 Trevor’s family had 3 horses including Leigh’s pony Ozzie surrounding the ceremony site. I loved that they felt like a part of the ceremony. I loved all the attention to detail with the stunning florals and that arbor was simply beautiful. 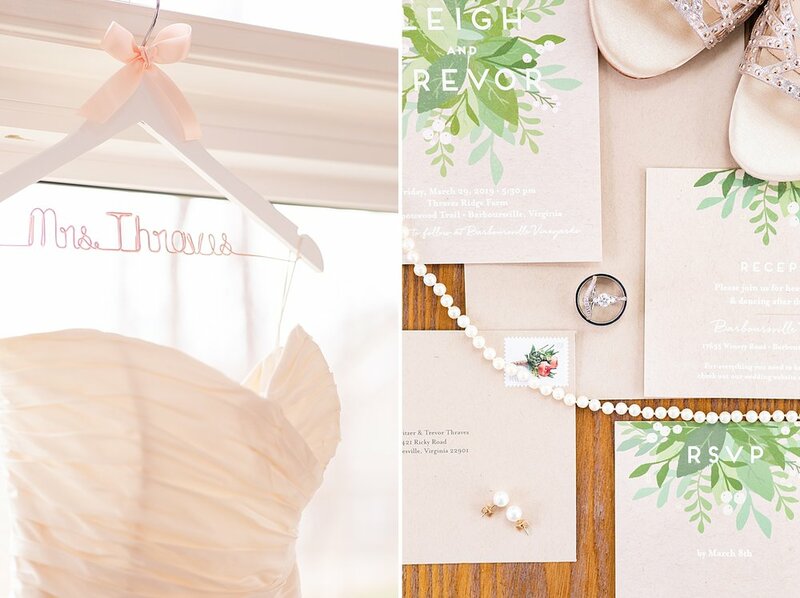 These wedding detail photos are some of my all time favorites! During the ceremony sweet little Trip (their son and star of the show if I’m being honest!) was so behaved for a little guy! He loved the greenery on the arbor and played with it while standing at the front. 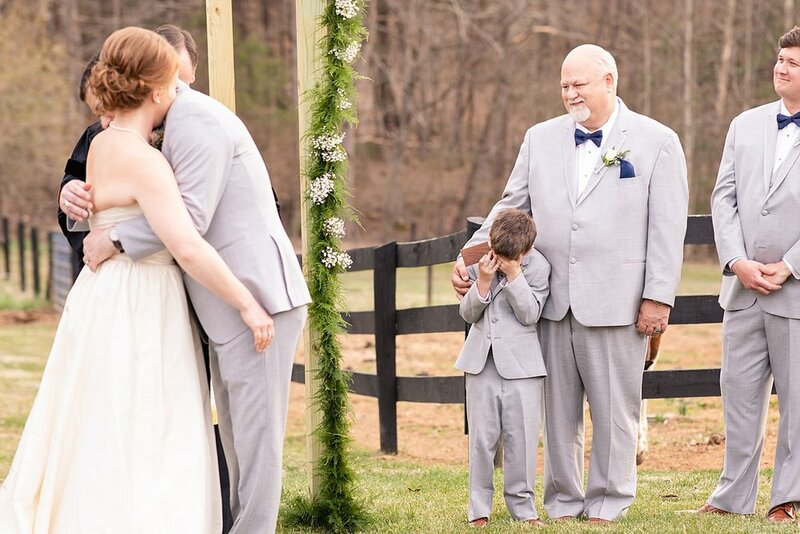 Just wait till you see his reaction when the bride and groom kiss! Classic kid reaction to parents smooching!! 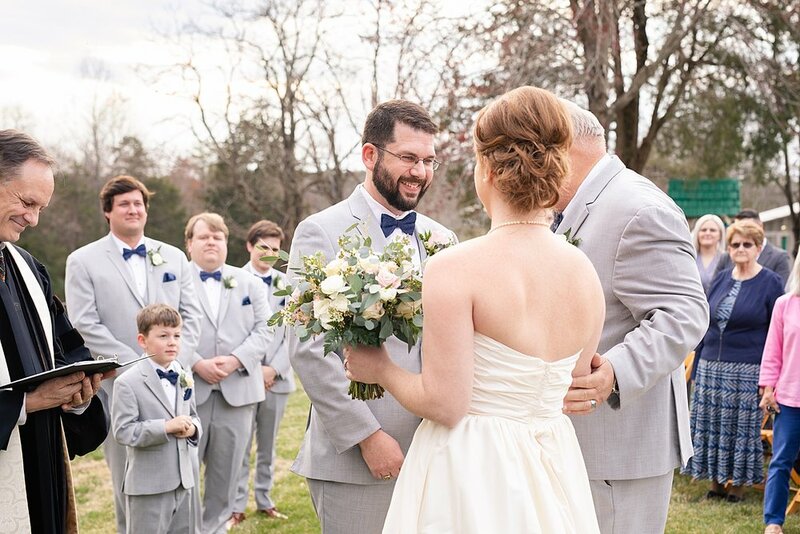 He also gave me the most perfect facial expressions during the bridal party photos. He is such a ham!!! So I found out after the ceremony that Leigh wished for clouds during her ceremony so her and the guests didn’t have to squint the whole time. I wished for the sun to pop out for their portrait time so that their images would have some pop! Cloudy days are certainly easier to photograph but I love for my images to pop and have vibrant colors. The best way to do that is to be outside in the natural sunlight! The coolest thing was that BOTH our wishes came true! 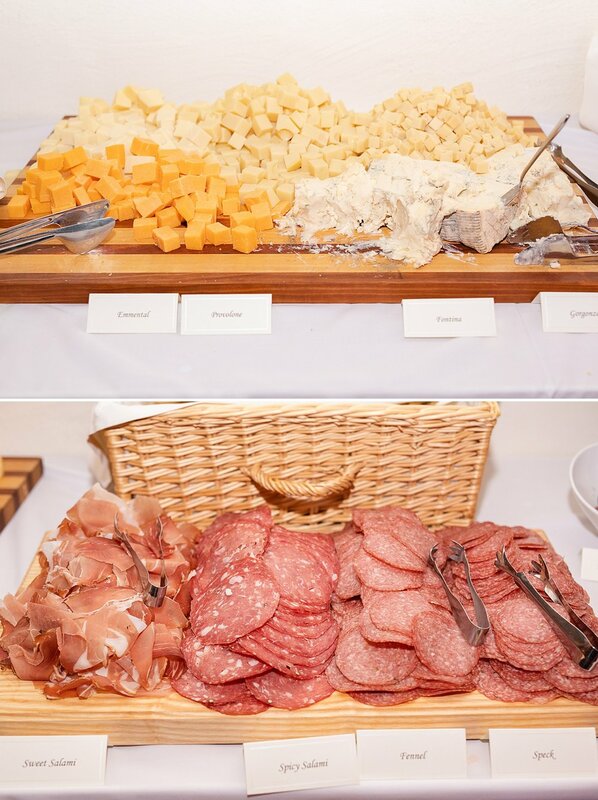 After the ceremony, James drove ahead to the reception venue, Barboursville Vineyards, to photograph the setup before guests arrived. 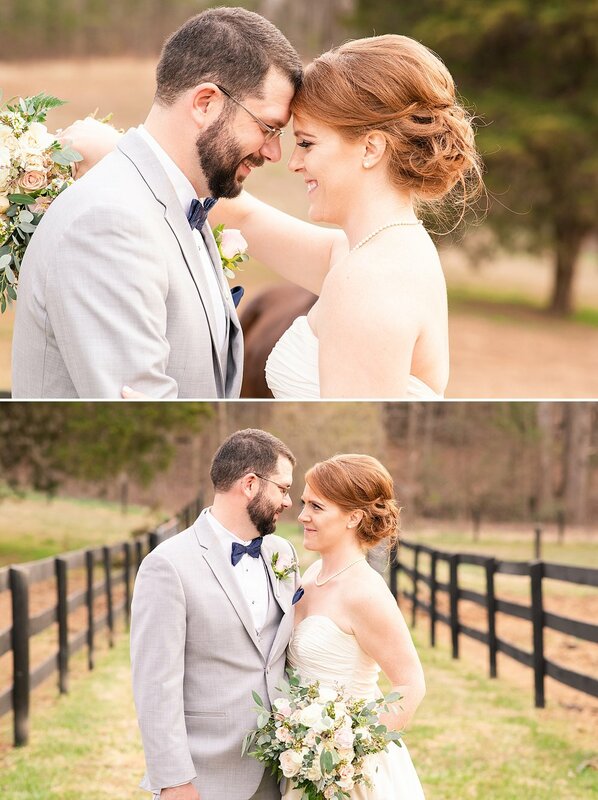 I stayed behind with the love birds for the first set of portraits on the farm! 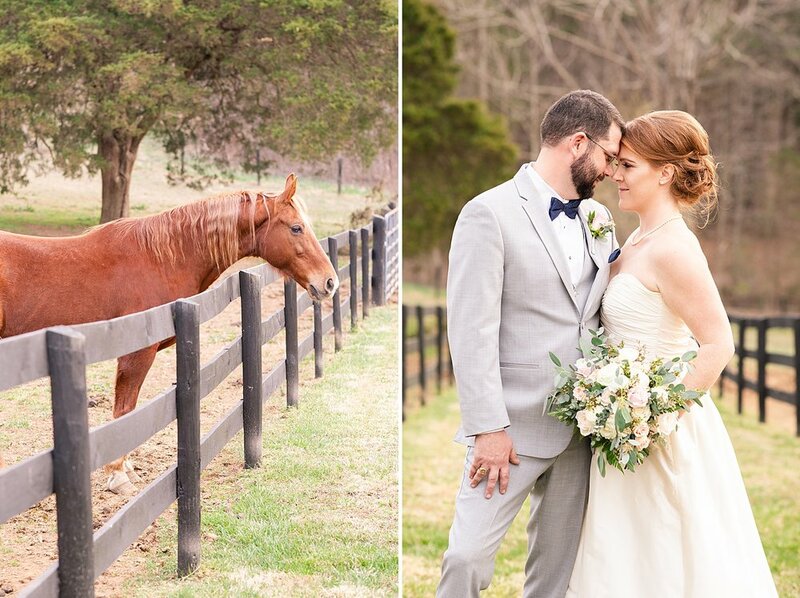 I loved the fencing and of course the horses for these photos. I’m so glad these two remembered their engagement session posing because we had limited time at the farm. We finished up at the farm and had a little time left before the reception started. 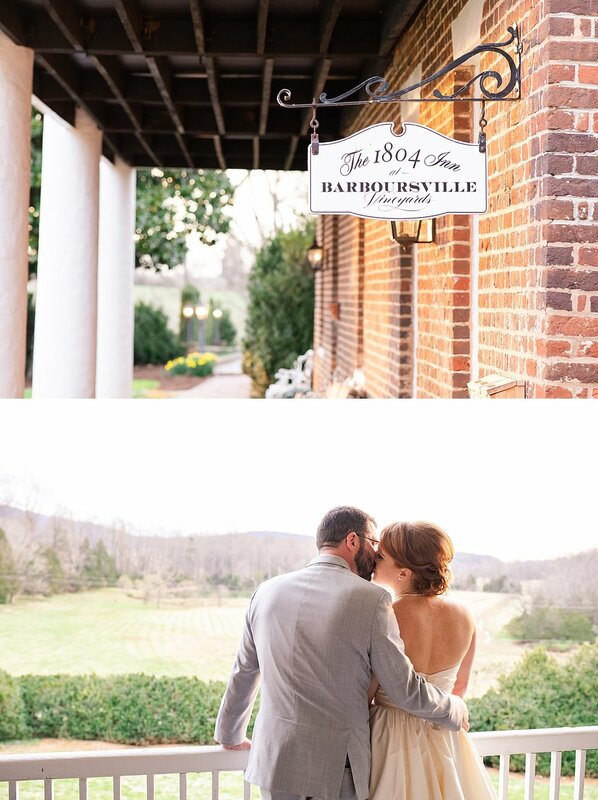 So we headed over to the Barboursville Inn where they would be spending their first night married. Leigh told me about the balcony views and I am so glad we made time to stop there! James joined us for the rest of the portraits and got really creative with angles and poses to create stunning portraits in only 8 minutes! When your bride and groom are this good at posing 8 minutes is all you need to get amazing images! And trust me these balcony portraits are stunning!! The rest of the evening was so much fun! James and I enjoyed getting to know Trevor and Leigh’s talented wedding vendors of Barboursville Vineyards and the Palladio Restaurant! Jason Guyton, the DJ, was the nicest guy! He welcomed us and our gear bags to his corner of the party and we had a front row seat to his dance floor! 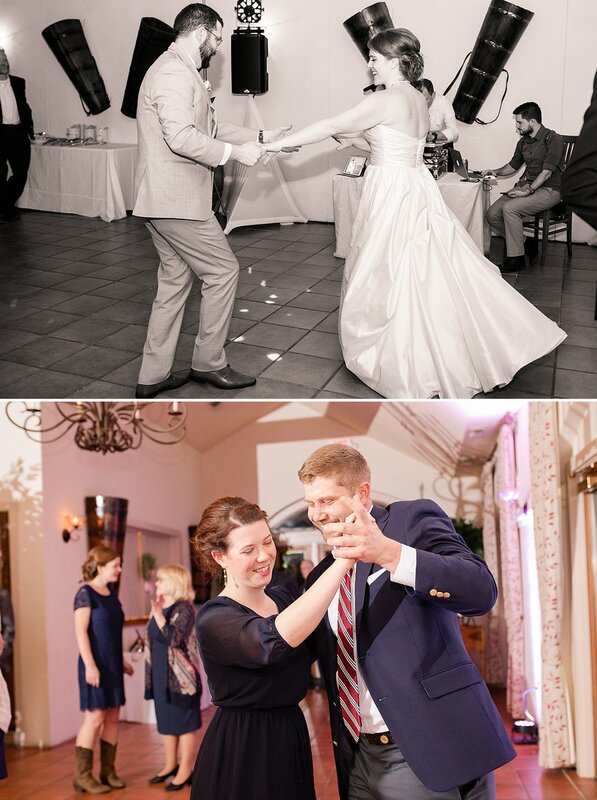 I will have to say that this reception was a night to remember for me because one of the guests pulled me on the dance floor! Yes there is a photo of that below! I have decided that I need to practice so that my two left feet don’t embarrass me again. 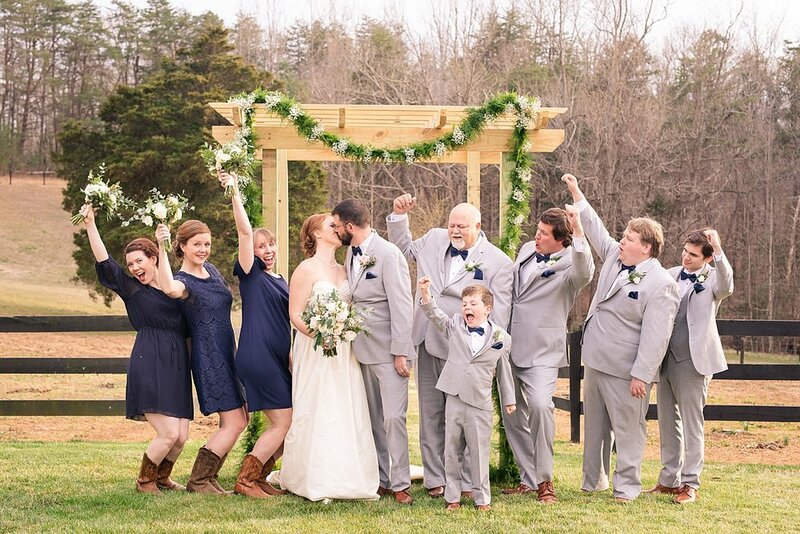 This was my first wedding in Charlottesville and my first at Barboursville Vineyards! I cannot wait to photograph this venue again! 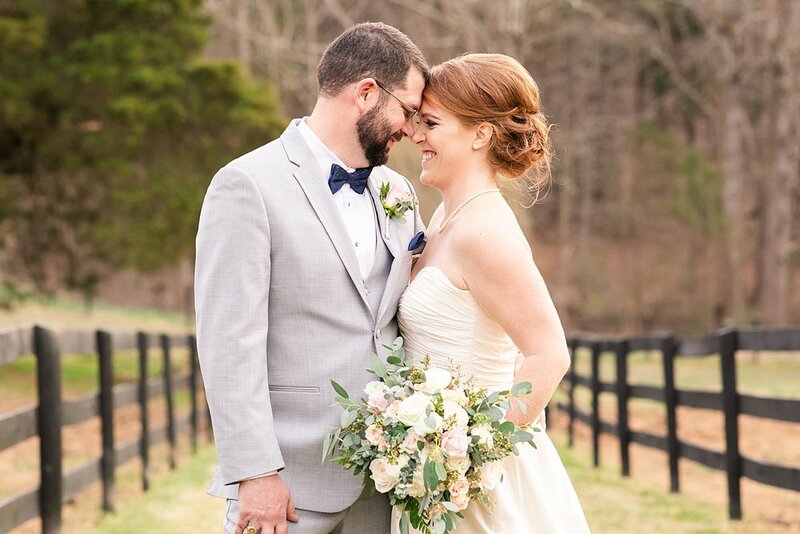 My 2019 weddings have been absolutely beautiful so far, how did I get so lucky?? It was an honor to be a part of such a special day in their life. 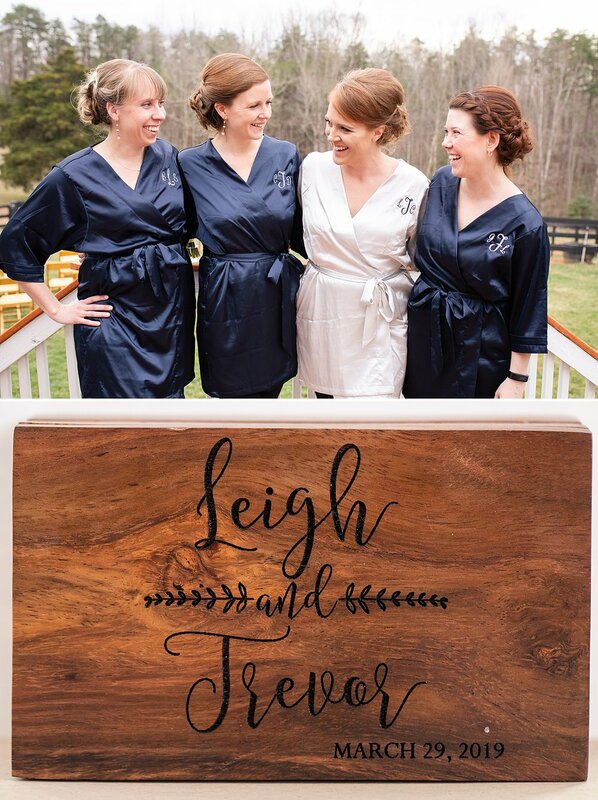 Enjoy Trevor and Leigh’s beautiful Charlottesville wedding!! I love the Mrs. Thraves hanger!!! Her grandmother’s pearls!! I love this shot in Leigh’s bouquet! Ok so this bouquet was very special. 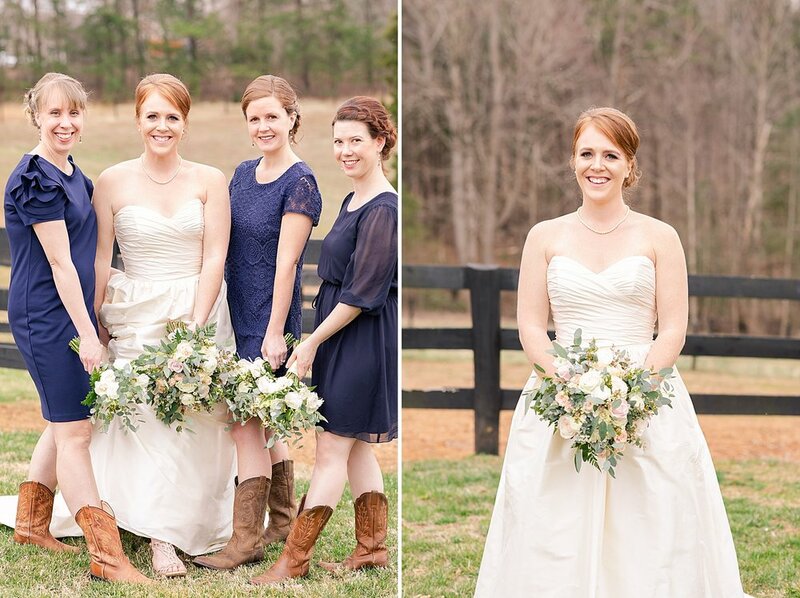 Leigh’s wedding date was not an ordinary Friday wedding. It was the anniversary of her father’s passing as well as her birthday! I told myself I could NOT cry all day because Leigh was so strong. I knew I had to be strong for her! I know that her father was with her and maybe the reason our wishes came true??? 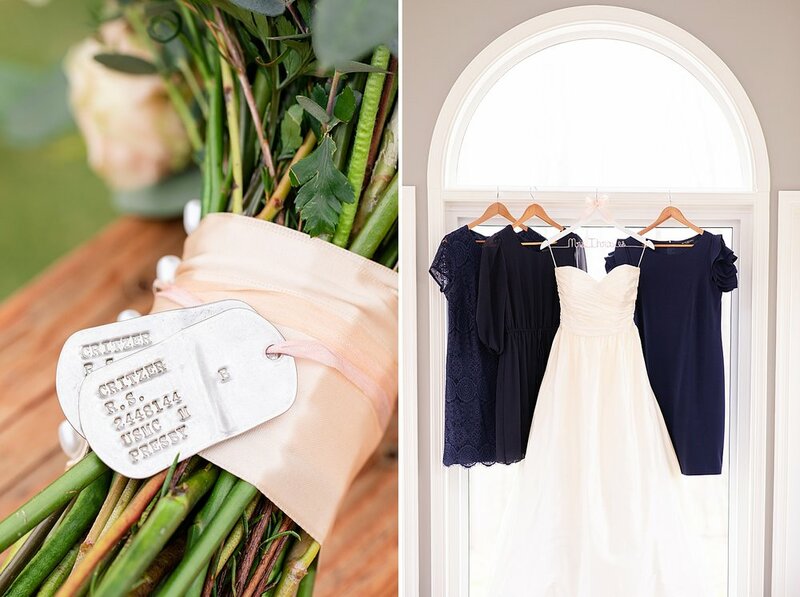 I loved that she included his dog tags in her bouquet. What a special way to honor him! They traded love letters to read before the ceremony! How sweet is that?! SO CUTE!! I love the mini’s! This sunroom window is perfection! Ozzie was such a character hiding from my camera! Wedding dress with pockets are my favorite thing! 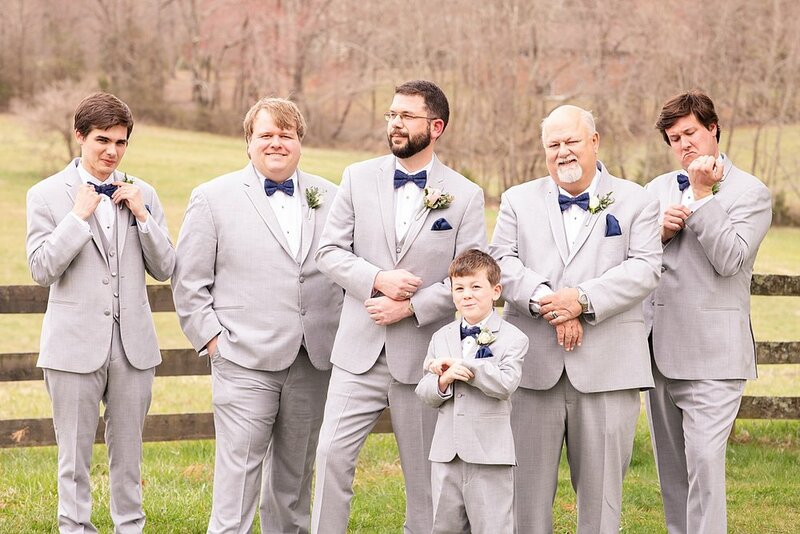 Look at sweet Trip watching Leigh come down the isle! Melts my heart!! Classic kid reaction to parents kissing! Too funny! I cannot handle Trip in these photos. What a ham! I loved this spot for photos. The property is so beautiful! These two love their red barn wall photos!! I have to say it was another great spot for their portraits!! 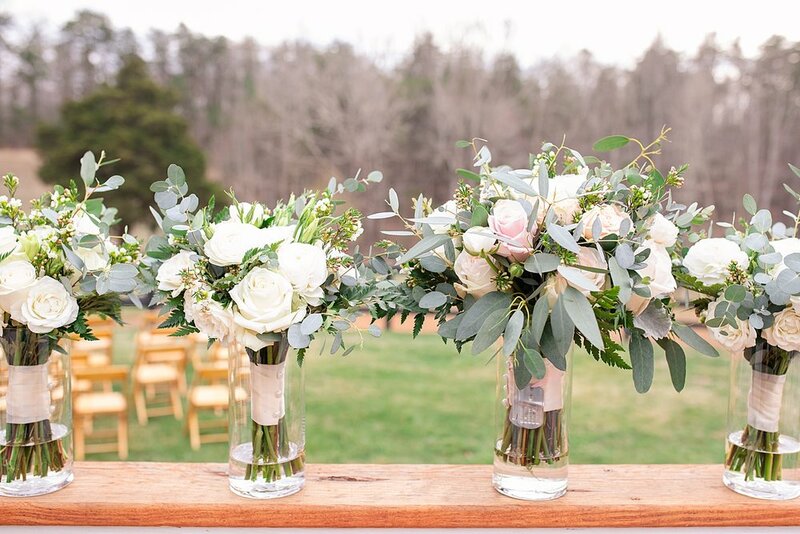 James had a field day with the details in this beautiful venue! This cake was divine! It was my first time eating Albemarle Baking Co’s cake and I have to say that Leigh and Trevor chose well!! The most fun and embarrassing dance ever! I also noticed while editing this photo, that there is a video or photo of me on this sweet ladies’ phone. Anyone else see her? So funny!!! We actually remembered to grab a photo with these two before the exit!!! Photo made possible by Jason Guyton! Thanks Jason! Love the multicolored glow sticks!! Such a fun and unique exit!